During the reign of the Emperor Constantine, the Christian Religion was constantly growing. In Constantinople itself the pagan philosophers felt very worried at seeing many of their skilful members deserting their old religion and joining the new. They pleaded with the Emperor himself, demanding that they should be allowed a hearing and to hold a public conference with the Bishop of the Christians. St. Alexander was the Patriarch of Constantinople at that time, he was a holy Bishop but not a great speaker. He did not for that reason want to meet with the pagan philosophers, who were good at public debates and eloquent orators. However, Alexander prayed asking the Lord to help him. On the appointed day, before a vast assembly of learned men, the philosopher began a carefully prepared attack on the Christian teaching. The Holy Bishop listened for a short time and then simply pronounced aloud “In the Name of our Lord Jesus Christ I command you to be quiet!” and the pagan suddenly became mute. which at once confounded the philosopher, who not only completely lost the thread of his discourse, but was utterly unable, even with the aid of his colleagues to return to the attack! They were completely silenced at the mere mention of the Holy Name of Jesus. When he gestured with signs to acknowledge his errors and affirm the correctness of the Christian teaching, then his speech returned to him and he believed in Christ together with many other pagan philosophers. The faithful rejoiced at this, glorifying God Who had given such power to His saint. 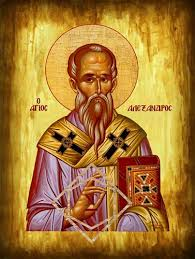 On another occasion, the heretic Arius was punished through the prayer of Saint Alexander. Arius had apparently agreed to enter into communion with the Orthodox. When the Emperor asked him if he believed as the Fathers of Nicea taught, he placed his hand upon his breast (where he had cunningly concealed beneath his clothes a document with his own false creed written upon it) and said, “This is what I believe!” Saint Constantine, unaware of the deceitful wickedness of Arius, set a day for receiving him into the Church. All night long Saint Alexander prayed, imploring the Lord not to permit this heretic to be received into communion with the Church. In the morning, Arius set out triumphantly for the church, surrounded by imperial counsellors and soldiers, but divine judgment overtook him. Stopping to take care of a physical necessity, his bowels burst forth and he perished in his own blood and filth, as did Judas (Acts 1:18). This entry was posted in The Saints and tagged Church, conversion, miracles. Bookmark the permalink.